Set out on a relaxing, luxurious cruise with the LEGO Creator Cruising Adventures set. Build a colorful cake shop with a roof terrace, seating area, stairway, rotating cake stand, cash machine and a gumball machine. 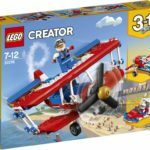 Amaze your friends with the 3-in-1 Daredevil Stunt Plane set, featuring a colourful biplane with stars and golden detailing. Rebuilds into a Rocket Car or a Rocket Boat. Includes a mini-figure. 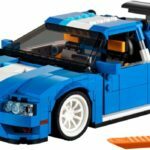 Enjoy racing adventures with this LEGO® Creator 3in1 Extreme Engines set, featuring a Race Car with a sporty blue, white, yellow and black color scheme and authentic detailing, including a large rear engine, side air intakes and wide rims with low profile tires. 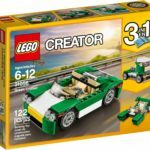 Drive in style with this sleek open-top Green Cruiser, featuring a green, white and black color scheme, tinted windshield, opening front trunk and rear hood, detailed engine, and a large two-minifigure cockpit with detailed dashboard and steering wheel. Open a world of adventures with this exciting 3-in-1 Toy & Grocery Shop. Serve your customers with fresh fruit and vegetables, a morning paper or delicious beverages at the cozy grocery shop, or visit the neighboring toyshop where there’s a cool toy robot for sale! Enjoy urban adventures at the 3-level Family Villa, featuring a red-tiled roof, white facade with lots of windows and colorful details, plus a garden area with a basketball hoop, outdoor fireplace, mailbox, doghouse and a stairway that leads to a mid-level terrace with a sun lounger. Interior details include a bedroom and kitchen, tables and a sofa. 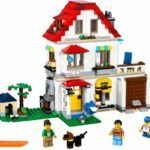 Mix and match the buildable modules and easily swap the window, door and other modular sections to customize the house with the new-for-June-2017 LEGO® Creator modular system. Combine this set with the 31067 and 31068 modular-system sets to create a dream house with endless build and play opportunities! 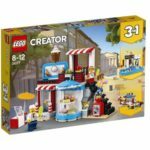 This 3‑in‑1 LEGO Creator model can also be rebuilt to create a Golf Hotel or a Summer Villa with a swimming pool. Build the bright and airy Modern Home, featuring a white, brown and pale-blue color scheme, large windows, solar skylight, upper-level bedroom and balcony with parasol, and a ground-level room with sofa and armchair. 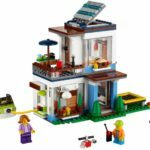 Mix and match the buildable modules to create a rooftop terrace, and easily swap the window, door and other modular sections to customize the house with the new-for-June-2017 LEGO® Creator modular system. Combine this set with the 31067 and 31069 modular-system sets to create a dream house with endless build and play opportunities! 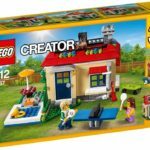 This 3‑in‑1 LEGO Creator model can also be rebuilt to create a Lakeside Home or a Garden Home.